Reading my own books might seem strange but I find it to be an important part of the process. And yes I do laugh at my own jokes 😂 Currently at the scene where the trio and friends visit Olaf for the first time in “Castle Squalor”—Olaf’s house. It’s one of my favorites in Honor’s Price. Do you have a favorite scene in the book? Honor’s Price (Fury of a Rising Dragon, book 2) has launched! When a cunning enemy enslaves the kingdom, a famed warlock-knight must survive a gauntlet of perils to save his people. Augum Stone is only sixteen and already a legend. He heard his name chanted in the arena by tens of thousands. He vanquished a notorious tyrant and ended a war. And he revived a warlock-knight order that lay dormant for generations. But these feats came with a price—he needs combat to feel alive, to test his limits. As Augum struggles with restraint, a callous enemy kingdom enslaves his people. And that enemy wants more than mere control—they’re searching for an ancient weapon with which to conquer Sithesia. rival . . . and Augum’s own reckless nature. This launch marks three years of full-time writing. Three years. In total, I published seven books, stacking up to 1.24 millions words. I am grateful to you, dear reader. And I am grateful to my amazing wife, who believed in my writing when she could have easily told me, after I had already failed in making a living in my music career, that I should be more practical. Yet she pushed me to see where it goes, knowing I was having a blast writing. And I’m still having a blast writing (thank you, my love!). Many of you have written me wonderful heartfelt letters expressing your love for the trio’s journey. You have motivated me to give it my all with this work, which has been a year in the making. It’s a big book—230,000 words / 634 paperback pages, almost as long as Legend. In this new chapter in their lives, our illustrious trio find themselves embroiled in a new adventure—one of courage, determination, and especially, growth. Now on the book. The kindle version can be purchased from Amazon HERE. The paperback version can be found HERE. Enjoy the adventure, and I’d love to hear your thoughts when you’re done reading. It’s that time! Here’s the cover and blurb reveal for Honor’s Price (Fury of a Rising Dragon, book two). (Launch is on schedule for the end of the month). Now, with the future of all the kingdoms at stake, Augum and his friends must cobble together lost historical clues to find the weapon before the enemy does. Standing in the way is a manipulative prince, a traitorous nobility, a vengeful rival . . . and Augum’s own reckless nature. Are you as excited as I am? The book is undergoing formatting as we speak, and we’re still looking at a late September launch. You’ll hear from me again soon! P.S. I just sent out an email to all my subscribers which includes the first chapter (those of you with Gmail accounts may want to check your “Promotions” tab–and drag and drop them into your regular email tab, as sometimes emails get lost in the shuffle like that). Augum, Bridget and Leera news; audiobook news; and an interview with AC Cobble. 1. Augum, Bridget and Leera news. 2. Audiobook contract signed for Fury of a Rising Dragon series. 3. I interview AC Cobble, author of the bestselling fantasy series Benjamin Ashwood. Item 1: Augum, Bridget and Leera news. I’ve been getting a lot of emails asking when Honor’s Price (Fury of a Rising Dragon, book two) will be ready. Well, I finally have some news on that front. I finished the first draft of the book and the first edit round. It’s now entered the deeper editing stages, which will be compromised of approximately six more additional rounds of editing before it will be ready. So we’re looking a late summer-ish launch. It’s a big book, almost as big as Legend (The Arinthian Line, book five), and is packed full of action, drama and plot. Augum, Bridget and Leera discover ancient secrets about Arcaners while facing a Canterran cult, assassins, and the Von Edgeworth line. There’s a turning-sixteen womanhood ceremony for a certain someone, numerous personal trials for the trio, a frank encounter between Augum and Jez, new spells, and loads more. Item 2: I signed an audiobook contract with Tantor for the Fury of a Rising Dragon series. I’m excited to announce that Fury of a Rising Dragon will become an audiobook series! I’ll announce who the narrator will be on my author Facebook page shortly. As to The Arinthian Line, I’m in talks with Grammy winner Stefan Rudnicki to finish the series, so keep your fingers crossed (Audiobooks are notoriously expensive projects and I write long books, so no guarantees yet). Item 3: I’m trying something different: an interview with an author some of you may have already heard about :) Away we go! I’d like to welcome AC Cobble, the author of Benjamin Ashwood, to this edition of “Milk Crate Interviews with Sever Bronny.” AC, there’s your milk crate (mind the dust and piles of half-read books) and I’ll take my seat on mine after this awkward pause. All right, isn’t this fun? My wife works with me in my author career and is super supportive (she set up the milk crates for this interview. You might find her lurking about the place munching on granola bars, Kindle in hand). I also have a cat named Buddha. She’s a small loaf with big eyes and likes to wander about the place like a princess. Any pets, kids, dolphins on your end? Wife? Husband? Hi Sever, thanks for having me! I’m married to a wonderful wife who … well … initially said no to me becoming a full-time author. She came around though! She has an open mind, if not an initial faith in my ability to tell a good yarn. To be fair to her, my last creative endeavor was painting. It ended in a lot of brainstorming and a still-blank canvass, which she’d bought me for my birthday 6 years ago (someday, someday). We have three children, all boys, ages 8 months to 5 years. Now that I work from home, taking time out of the day to deal with the fighting, crying, and people yelling for food is a wonderful reminder of what my corporate life used to be like. It’s like I never left! My wife has a dog, which after 10 years of dating and marriage has still not accepted me. Maybe the nightly battle where the dog “forgets” she has her own bed in our room and doesn’t need to be in my spot is just a friendly joke? Every night I get a look from the dog that says, “I would prefer it if you died”. Ah, what else? I’m from Tennessee originally but live in Houston, TX now. I love to travel but have very few hobbies outside of writing and the family. You mentioned you lived a “corporate life.” What exactly does that mean? Any parts of that life you miss? What do you love most about being a fulltime author? Before making the jump to the book business, I worked for a massive, global corporation (think top 5 in the world). My days were filled with the normal things at any place like that – meetings & e-mail. There were plenty of the stereotypical people and politics that you can imagine going on, which I don’t miss a second of. But there were also some really awesome people who I keep in touch with still (had a few over for dinner this weekend!). I also really enjoyed my final role at the company. I was something like an internal consultant. I traveled about 25% of the time, worked from home 74%, and went to my local office 1%… That was pretty cool – and helps explain how I held a full-time job and wrote a couple of novels. I role allowed me to travel all over the world. I worked in 8 different countries. I saw some really amazing places that I never would have seen otherwise, and a lot of those influences made it into my books. What’s best about being a full-time author? Freedom. You’re the captain and crew of your own ship, and you can sail where ever you please. I imagine many people who own their own businesses feel the same way, but as Authors, we don’t keep a storefront, we don’t have hours we’re open, we don’t have clients we go visit. What we do, is entirely up to us. That is an amazing feeling. You’ve written a story in the same genre as me which makes me feel like we’re kindred spirits (come here, buddy! *awkward hug*). What made you so badly want to write coming of age fantasy? What initially inspired Benjamin Ashwood? Nothing better than meeting another author and doing the handshake, fist-bump, hug dance! Somehow, that always ends up with me gently punching people. I’m ready for the union to proscribe a standard greeting we can use when we emerge, pale faced and blinking, from the writing caves. I was inspired by the books I grew up reading. Robert Jordan, JRR Tolkien, David Eddings, those guys. I love the way all of their stories start, and that’s how I started my tale. A young boy leaves his small village on an adventure. It really spoke to a younger me, and it still does today. It’s the sense that you don’t know what will happen next, but anything is possible. It’s one of the times a fantasy trope connects really solidly with my real life experience. Sometimes, I feel like I hewed too close to those books in the beginning of Benjamin Ashwood, but it’s intended as an homage to the stories I love. As you read deeper in my series, the themes and plots diverge wildly from the books I grew up with. I started on the shoulders of those giants, but the core of the story takes the expectation from those tales and turns it on its head. In real life, I don’t think heroes are Chosen Ones, and I wanted to write a story about that. What challenges you these days? In addition to writing my Benjamin Ashwood series, I’ve started a small press called Cobble Publishing. I have 3 other authors under my banner and we’re in production with several of their books! Juggling that along with my own work is a logistical nightmare, but it’s the kind of challenge I really enjoy. At heart, I’m still the business guy I was before I began writing, and I love that part of publishing. What’s coming up next for you that you’re excited about? Whew. I told you there were some logistics involved! Finally, I’m doing some early groundwork for a brand new series that I hope to unveil in late 2019. The amount of world building and character development I’m doing is far more than I’ve done before, but if this works, it will really pay off for readers (um, I hope). That’s a lot on your plate, are you not worried it will take away from your writing energy? I’ve found that having something else going on really helps keep the creative juices flowing. This began as a hobby for me, a way to relax from the stress of the job, new kids, etc. Writing is my down time, and it relaxes me. When I’ve tried to ramp up and go full bore, I burn out pretty quickly. Very rarely have I been able to sit down and write for a full day. When I have managed it, I needed several days off to recover. So, maybe because it’s how I got my start, I tend to write in bursts of 2-3 hours then switch gears and focus on something else. The great thing about starting a small press is that “something else” keeps me engaged in the industry. I love books, being around books, writers, and every aspect of this process. It’s all fun to me, and it keeps me busy while those creative juices recharge. You and I are extremely lucky to do what we do full-time. I occasionally dole out advice to budding writers who dream of becoming full-time authors. What advice would you give to those who wish to make this a full-time living? Yes, you get to do all of the awesome creative stuff. And yes, you are your own boss. It’s completely true, you can work anywhere in the world, at any time. Literally everyone you meet will be jealous. You make up stuff and write it down for a living! But, you also have to do the icky parts of the job. This is your business – you should treat it like a business. You have to market, you have to do book keeping, you have to negotiate, you have to invest in your product, and you have to hold yourself accountable for getting it done! More so than anything else, like a business, you have to serve your customer. Everyone telling you to “write only for yourself” is, in my mind, doing you a huge disservice. It’s not to say you can’t write what you love – see earlier about my influences – but if you want to sell what you’ve written, someone has to want to read it. At the end of the day, the job of the writer is pleasing the reader, not themselves. They’ve made you walk the plank. What was your crime, and any parting final words for humanity? Ha, I love this question! Because it’s easy for me to answer… I’ve been in the rum barrel. AC Cobble is the Amazon bestselling fantasy action & adventure author of the Benjamin Ashwood series. Coming December 1st . . . When a young man chooses a forbidden calling, he must prove his worth … or watch his kingdom fall. 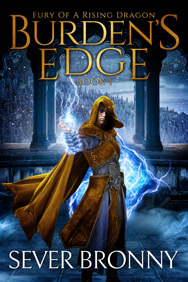 Sixteen-year-old Augum Stone is a warlock prodigy suffocating under the weight of expectations. Students idolize him. Nobles plot to exploit him. Commoners think he’s a miracle-maker. And with invasion looming, his already war-weakened kingdom expects him to be its champion. But Augum doesn’t want to be a pawn in someone else’s game. He’ll forge his own path: that of the Arcaner—not a warlock or a knight, but a lethal combination of both. Legend says Arcaners once had the power to summon dragons. If true, it could change everything. Resurrecting the Arcaner path comes with consequences, however. Scandal. Malice. Treachery. And a harrowing test of character. He must prove he’s worthy of an ancient path. And he must save the kingdom . . . before it’s too late. Are you as excited as I am? At long last, the first installment in the trio’s next grand adventure is nearly upon us. We only have a few weeks to go. 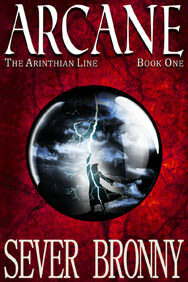 The book is 145,000 words long, which is one and a half times longer than Arcane. Expect it to launch December 1st. I can’t wait for you to read Augum, Bridget and Leera’s next saga! — Sever Bronny, author of The Arinthian Line. P.S. Subscribe to my newsletter to get a notice of release. The other day my wife and I met Claire, a fourteen-year-old fan of The Arinthian Line, as well as her wonderful parents, one of whom also read the books. Her mother told me Claire “fell in love with reading” because of the series. I don’t get to meet readers often, but to meet one who began a grand adventure into the world of books because of my work . . . well, it was truly a special occasion. Short but exciting update: the first draft of book one in the coming new series is almost complete, and it’s name is BURDEN’S EDGE. It’s about Augum, Bridget and Leera dealing with the responsibilities of going to the Academy of Arcane Arts while navigating royal intrigues. The series title will not be announced for some time still and is expected to be a trilogy. Projected release date for book one is late this year. In unrelated news, here’s a shot of me celebrating Clash’s admittance to the local library, which happened last Thursday.